Amazon is adding a kid-friendly tool to its Kindle Fire product line with the next over the air update. Kindle FreeTime is a new way for parents to turn the Kindle Fire and Kindle Fire HD tablets in to an entertainment system for the kids in your home without having to worry about them getting into areas of the tablet you want to keep them from, or from exploring too much of the Internet. For $2.99 per month per child, or $6.99 a month for a family, Kindle FreeTime will provide the little ones with unlimited movie and TV episode streaming, games to play, books, educational apps and more. Thanks to parental controls, you can also set how much time they spend per day with their new favorite entertainment device, and can even define it by which activities they spend that time with. If you’re curious why you would need to pay for each child, they will be able to customize the experience to themselves and save their settings. With various Kindle Fire models sure to be given as gifts this holiday season, this couldn’t be arriving at a more opportune time for the company. SEATTLE–(BUSINESS WIRE)–Dec. 5, 2012– (NASDAQ: AMZN)—Amazon today introduced Kindle FreeTime Unlimited, bringing together for the first time all of the types of content kids and parents love—books, games, educational apps, movies and TV shows—into one simple, unlimited, easy-to-use service for kids ages 3-8. For a special monthly price of just$2.99 per child or$6.99 for the whole family, Prime members get unlimited access to thousands of popular kids titles. Customers who are not yet Prime members can sign up for FreeTime Unlimited for a monthly price of$4.99 per child or$9.99 per family. FreeTime Unlimited will be available on the all-new Kindle Fire, Kindle Fire HD and Kindle Fire HD 8.9” as part of a free, over-the-air software update that will be automatically delivered in the coming weeks. FreeTime Unlimited offers many of the most popular children’s games, with all in-app ads and in-app purchasing removed. Games include Disney’s bestselling Where’sMy Water? and Where’sMy Perry?, as well as Fruit Ninja Puss N’ Boots, Cut The Rope,Peekaboo Barn, Counting with the Very Hungry Caterpillar, Magic Piano and popular early development games like Kids Learn to Read, My First Puzzles Dinosaurs and SUPER WHY! FreeTime Unlimited also includes hundreds of eBook apps with Read-to-Me functionality and in-book games from characters such as Thomas & Friends, Looney Tunes, Scooby-Doo, Arthur, Duck and Goose, Caillou and Superman, and from award-winning children’s authorSandra Boynton(“Moo, Baa, La La La!”). FreeTime Unlimited includes movies from Barney, Thomas & Friends, Bob the Builder, Fireman Sam and Angelina Ballerina, as well as TV shows like Sesame Street, Spongebob Squarepants, Dora the Explorer, Blue’s Clues, Diego,Yo GabbaGabba, The Backyardigans, Rugrats, Arthur, Reading Rainbow, Caillou, and Garfield. 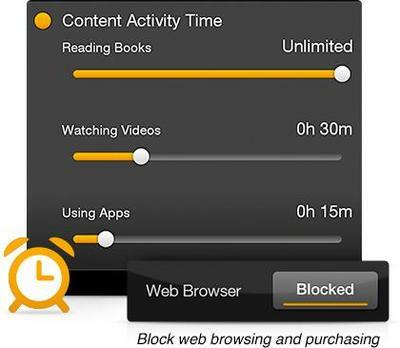 Amazonis also working with Common Sense Media, the non-profit organization that provides independent ratings of books, movies, television, apps, games, websites, and music, and many of their top-rated media choices for children are included in Kindle FreeTime Unlimited. FreeTime Unlimited will be available on the all-new Kindle Fire family as part of a free, over-the-air software update that will be automatically delivered in the coming weeks. After receiving the software update, customers can sign up for FreeTime Unlimited from within the Kindle FreeTime app on their $159Kindle Fire, $199Kindle Fire HD, and $299Kindle Fire HD 8.9”. Customers can learn more at www.amazon.com/freetimeunlimited.